Lately my daughters and I (we have 5) have been trying to make it a habit to have afternoon tea. They are loving it! I am loving it! We are making precious memories together! Even my boys want to join in now! So I have been trying to create more fun tea time dishes! What is a tea party with out pie? 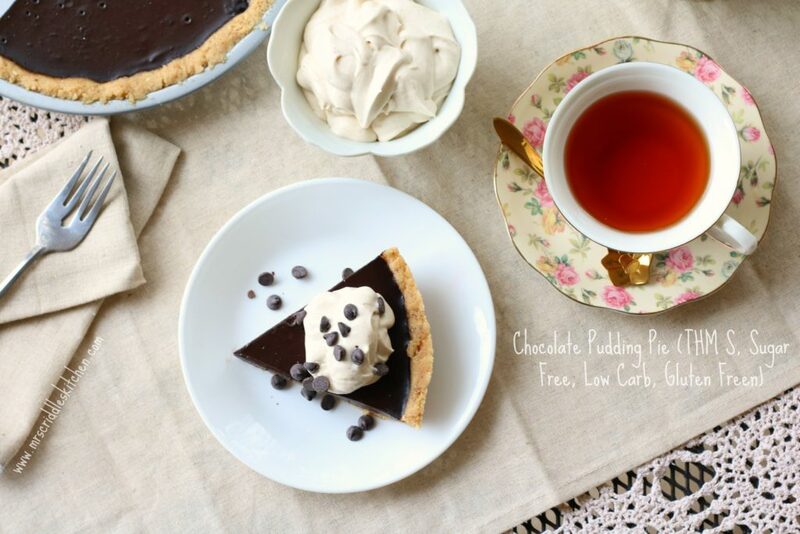 And I call it Chocolate Pudding Pie because the filling is made from my pudding recipe! I’ve been making this rich chocolate pudding for a while now! It’s so decadent and yummy! I figured it would make one delicious pie if I could get it to hold together well! 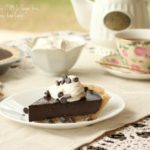 This Pie is great to make ahead for a party! And to serve with a homemade whipped topping! Sprinkle on nuts or chocolate chips… I use Lily’s Stevia Sweetened Chocolate Chips. I also added a little cinnamon to my whipped topping! I also wanted to make it a No-Bake Crust so it would just be easier! This crust is soooooo good!! I use it in my Fruity Summer Delight dessert too! If you need a good no bake crust, go with this one! 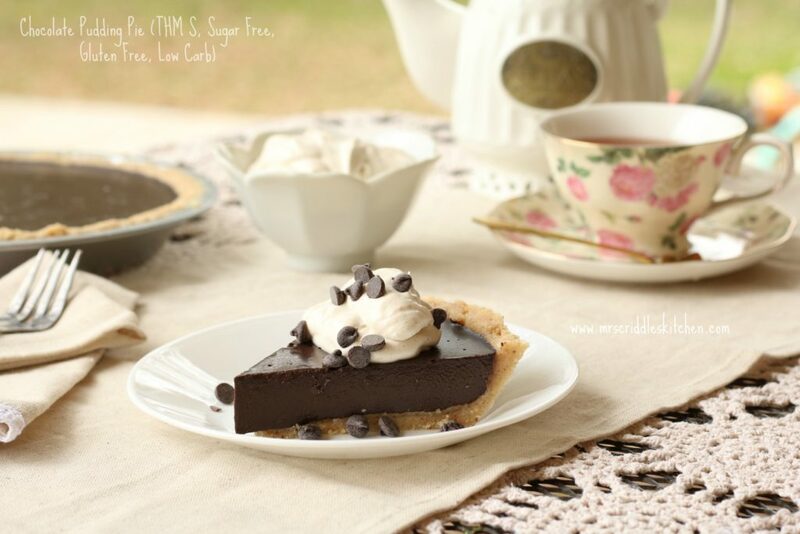 This pie is a sugar free, low carb, gluten free & THM S! Woohoo! Good fats and wonderful to share! NOTE: I wanted to talk a little bit about tempering eggs… when you are making the pudding part of the pie, you will need to temper the eggs or you will end up with Scrambled Egg Pudding! haha That does not sound yummy! Tempering eggs is not really as hard as it sounds! Whisk the yolks and egg together well in a separate bowl. Scoop up about 1/2 a cup of the hot pudding. Slowly with one hand pour the pudding mixture into the eggs while you whisk with the other hand. Don’t pour the eggs into the hot mixture, make sure it’s the pudding mixture into the eggs. Once you have it all mixture in and whisked together well you can pour into the rest of the pudding mixture on the stove. 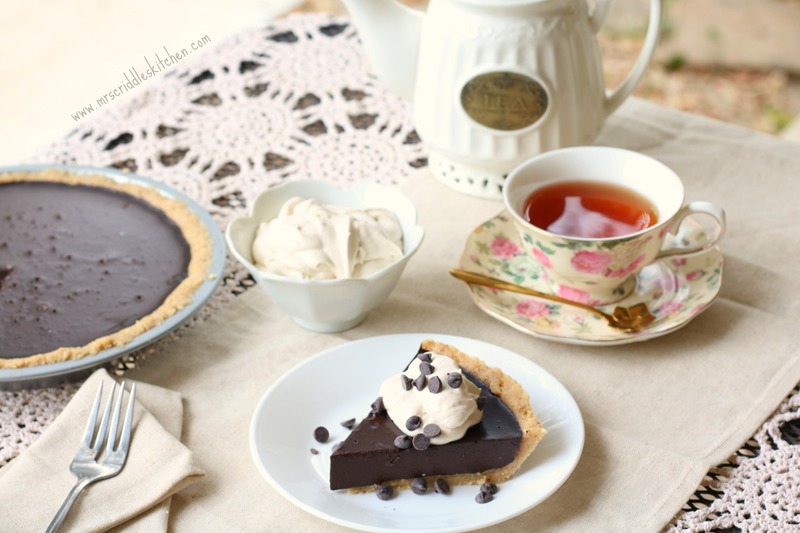 A yummy rich Chocolate Pudding Pie with a supper yummy No Bake Pie Crust! Make the crust first and place in a buttered pie dish. Press into a pie plate using plastic wrap so you are mess free. Place pie crust into freezer to harden. Mix the milks, cocoa powder, butter, sweetener, salt & vanilla in a sauce pan on medium heat. Stir until all ingredients are mixed well and mixture is hot. Separate the yolks of 5 eggs and place in a bowl. Whisk the eggs together well. Next you will need to temper the eggs. It’s easier than it sounds and very do-able if you follow the instructions. you will scoop about 1/2 a cup of the pudding mixture up. With one hand pour the pudding mixture into the eggs while whisking quickly with the other hand. Make sure you pour the 1/2 cup of pudding mixture into the eggs not the eggs into the pudding. After you have whisked the pudding into the eggs you can then pour the egg/pudding mixture into the remaining pudding on the stove. Continue to mix on medium heat until the pudding thickens up a bit (about 10 minutes or so). Then sprinkle the 1 tbsp. of Gelatin into the pudding mixture. Stir well and allow to cook for another 5 minutes or so. Allow to cool for at least 10 minutes or so. Pour pudding mixture into the hardened pie crust. Place in the fridge for at least and hour or two. Top with homemade whipped heavy whipping cream that mix up using a handheld mixer or blender! You can also top with nuts and sugar free chocolate chips. 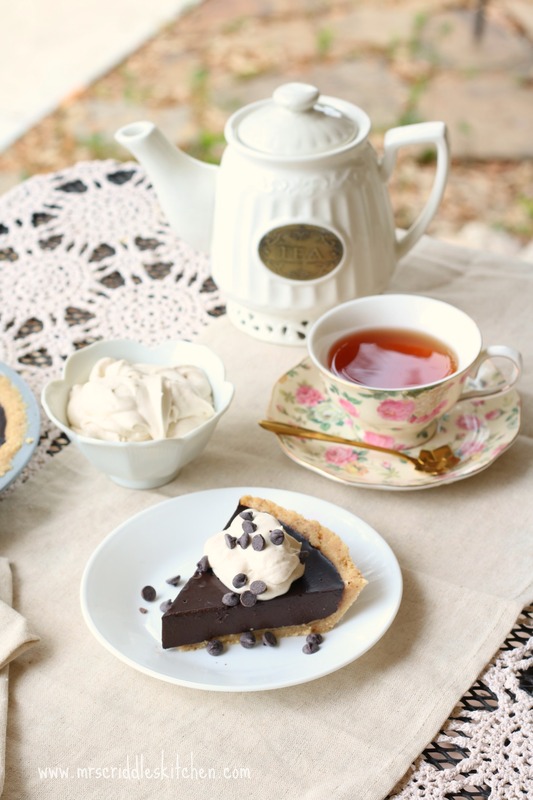 This is my pudding recipe so if you want pudding just serve in bowls instead of pie crust! Add whipped topping! Can’t wait to try this pie for my hubby!!!! Thanks!